Successfully Added Chuwi Vi8 Plus Ultimate Tablet PC - Intel Cherry Trail CPU, Licensed Windows 10 OS, USB Type C, 2GB RAM, 32GB Memory, OTG to your Shopping Cart. The Vi8 is an 8 Inch tablet PC from Chuwi and adopts the Intel X5 Cherry Trail Z8300 CPU, this is a 64 bit processor that has a max speed of 1.84GHz and uses the 14nm architecture, whats more its abcked up by 2GB or RAM. With up to 50% more power than the older 22nm processors and is also key to reducing the power consumption by as much as 20% so you get to enjoy more performance for longer. The Chuwi Vi8 has an 8 inch IPS display has a good vivid colors and a nice bright screen that remains easy to see even in bright daylight with impressive 1280x800 resolutions. To get the most form this is the Intel HD graphics that Intel says supports Direct X12, Open GL 3.2 and HTML5 hardware acceleration. All this makes the Vi8 great for media and games on the go letting you enjoy the greatest gaming hits. 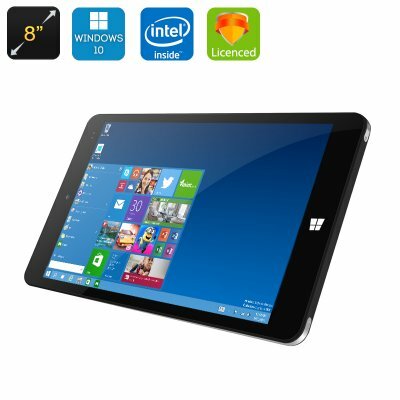 A fully licensed version of the Windows 10 software is installed on this compact tablet so you can have a mobile office experience with access to the Microsoft Office Suite and a range of other powerful production software. Providing enough space for this range of software is 32GB of built in memory and a micro SD card slot letting you add an extra 64GB of space. With USB Type C you don't need to worry about which way around the connector is and this bidirectional port brings superior speeds and a lot less wear on the decide as well as offering future proof connectivity and fast data transfers. The addition on an HDMI port means you can share information on a big screen by connecting to a TV or projector, great for movie nights or office presentations. With Wi-Fi, Bluetooth and OTG you can connect you mouse and keyboard as well as and game controllers. The Chuwi Vi8 comes with a 12 months warranty. Brought to you by the leader in electronic devices as well as wholesale Windows Tablet PCs.